Nice weather means only one thing: enjoying fresh air, soaking in the sun and resting your eyes outside among nature. Yes, soon it will be summertime; the best time for picnics. You will want to go to the beach, park or woods and have a great time, where you can energize and rest. But, is it possible to make your picnic waste-free? Well, taking care of our environment should always be our priority but it is not possible to enjoy our time outside if we are surrounded by waste. Just like you do your best to keep your home clutter and waste-free by using professional house clearance services in London, for example, you should also protect the environment. We bring you few simple and yet efficient ideas on how to make your picnic zero waste. When buying snacks or other food for your picnic, always buy in bulk. This way you will reduce packaging waste and still have enough food for your whole family. Homemade is always the best. You can make some cookies at home and bring them to your picnic. You can also make sandwiches or prepare a salad at home. You can immediately compost the fruit or veggies you won’t eat. Additionally, instead of buying juice or other beverages, you can make your own homemade juice or ice tea at home. Not only you will have less waste but you will also save a lot of money. If you like your juice cold, use a thermos. Also, make sure you bring some water with you and use reusable bottles instead of plastic ones. Plastic is not biodegradable. 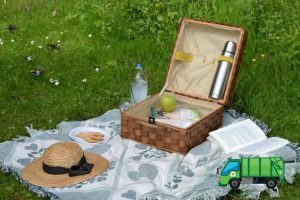 When going on a picnic, you will need plates, cups, cutlery and other dishes. Instead of bringing paper plates and plastic cutlery, bring real plates from your house. You will feel elegant when eating out of your fancy dishes and plus, you will produce zero waste. Reusable containers are always a better choice. You just need to put it in your dishwasher when you get back home and voila! No waste! After a great picnic, you will probably have some leftovers. This is also the time to plan ahead and know what to do with food scraps. You should collect all the food into your reusable container and toss it into the bin for organics if there is one at the park or beach. Another solution is to bring it with you and compost it. Additionally, make sure you bring any waste with you like plastic, paper and other. You can recycle what is recyclable or to even use to make your own compost. Zero waste picnic is possible if you put little effort and preparation into it. All you need to do is to think green and think in advance. Use reusable bottles, plates and other items you will need for your picnic. Compost leftovers. Recycle recyclables. And don’t forget, have a great time.